58 films from 19 countries were shown. By showing a smaller number of films than the year before we were better able to balance the lengths of the films and show more films twice, especially documentaries. 23 filmmakers were on hand at the festival, to present their films and meet the public. Attendance, at 1,689 members, was stable compared to 2003 (1,668). Reduced price memberships accounted for one quarter of that, slightly up on the year before. Entries to see films increased to 6,984 (6,151 in 2003), matching the number of entries in 2002 (6,997). We think the increase is due to our return to the traditional date for the festival -- during the school holidays and the All Saints Day public holiday, along with a better system for counting people entering the screenings. Like last year, the number of tickets sold in advance dropped, this time by 37 percent, no doubt due to a lack in communication. 180 members chose to buy the pass, which allows entry to all the films (against 183 in 2003). They made more use of the passes than last year, with passholders attending on average 13 films each. and the special evening on Saturday which broke records, with 728 viewers, the most we have had since the festival started. The reason for this record attendance could perhaps be explained by interest in the feature length film Inescapable. Or perhaps the prospect of a performance by the presenters, who were all dressed-up as Eve. In the smaller of the two cinemas we used during the festival, the Halle St-Pierre, six out of 10 films were packed houses, with between 77 and 95 viewers for an 85-seat capacity. Overall we have noted that the festival goers prefer to watch feature-length fiction films, militant films and short-length lesbian films. Sales of the catalogue dropped slightly by four percent. The fact that it came out late meant that we could not distribute it to bookshops during the festival. We also sold 104 t-shirts. Thanks to the subsidy we received from the Paris authorities, that bearing the poster by Ourida Dif was given as a present to the directors who came to the festival and to the volunteers who worked most actively. The festival party at the Loco attracted 565 women, of whom 63% were Cineffable members (against 463 at the party at the Folies Pigalle in 2003). Despite the high attendance, we still registered a small deficit because we spent more on renting out the hall and on communication. Our bar takings also dropped because partygoers were given a free drink, included in the ticket price. However, we managed to break even, as our three Tea Dances at the Tango did well. In 2004 we therefore registered a surplus of 4,509 €. When the subsidy from the Paris authorities is excluded from the calculation, we have a deficit of 10,491 €. This net deficit, corrected for extraordinary spending (or a drop in incomings), when financed by the subsidy, comes down to 1,893 €. 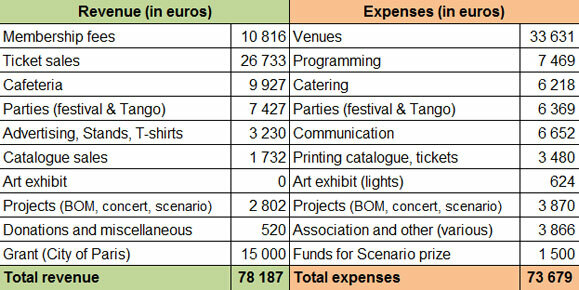 A more detailed study reveals that we spent 12% more on hiring the venues of the festival, particularly the Trianon, and on security measures. However, on the other hand, we managed to rein in spending on technical equipment by 32% and programming by 14%. Communication costs also decreased by 15%. On the receipt side, while membership is stable and the number of people going to see the films is increasing, our receipts have dropped on that side by eight percent because we have spent part of the subsidy on reducing ticket prices, to help more women attend. Efforts by the catering team to make more food at home, also helped boost receipts of the cafeteria by 13.5 percent. We have also noted a drop in earnings from adverts, the partnerships struck up mainly involving exchanges of communication. Our mini-festival in June, Best of Mixed was also in the red for the second year running, with attendance having dropped to 506 entries, despite the success of the special screening on the Saturday (104 seats sold). Apart from being used to lower ticket prices, the subsidy was used to organise the free "discovery" session on the Saturday, to host the filmmakers who attended the festival, to improve equipment for the film projections in the Halle St-Pierre and the exhibition and to buy long-lasting equipment for several committees (the restaurant, translation, meetings, and technical committees). To conclude, the result is positive, but the team has to keep a firm grip on spending, because we have not yet returned to the position where we can finance the festival independently. The stagnation on the membership side, in particular, means that we should do more on the communication side.